I mentioned in Kitchen: Old and New how much I love cooking, and eating. During highschool I studied in a culinary apprenticeship program - at that time I was certain I wanted to be a chef (at times I have also been "certain" that I wanted to be a surgeon, psychiatrist, model, archeologist, actress, film director, photographer etc). Though pursuing a culinary career is not in my future, I learned a lot in that program. As a child I grew up with two parents who loved to cook and there were very few nights that they weren't home. So we lucked out and had home cooked meals everyday - however, this meant that I didn't know the first thing about making mashed potatoes, let alone a velouté or béchamel - I had never had to cook for myself. My apprenticeship taught me all of that and more. I learned a dozen ways to cook eggs, how to properly pour a glass of wine, and to love cooking with lots of butter. I think cooking school solidified the fact that I am a meat eater. I couldn't be a vegetarian to save my life. My love of food grew rapidly, and my love was not just for food in general, but for "fancy" food. I craved ornate salads with berries and nuts. I desired rich, creamy sauces garnished with herbs and carved fruit. My love of food presentation grew with my love of quality meals. Arranging a plate was like painting with flavour, texture, and colour; piling vegetables as high as possible was a challenge I delighted in. A plate's shape, the curve of a bowl, the width of a rim: these were all factors that influence the overall look of a plated dish. I'm no chef, but I believe this part of my life may have been where my love of pottery started - even if I didn't know it then. It was definitely the beginning of my love for food, meal sharing, entertainment, hosting, and cooking. I'm not a food blogger, but here's my dinner from a few nights ago. We had some leftover yams from yam chips the night before, so I made pancakes. I had never made them before, so I thought I'd share my revelation with you guys. I used two yams for Jesse and I. It made three pancakes. 1. Grate yams into a bowl 2. Beat two eggs and add. 3. Add spices (in my case paprika, chipotle), salt, pepper, diced onion and garlic. (Again, not a food blogger (or a "recipe" type cook) so use your judgement and taste buds to figure how much you want to add!) 4. Mix with your hands - this is the fun part. 5. Sprinkle in flour little by little until the yam consistency just starts to hold it's shape (like cookie dough... but shredded yams). 6. Heat up coconut oil in a frying pan (Roughly 1/4" - 1/2" deep?) - you can get coconut oil by the tub at a bulk food store, for cheap. 7. When it is HOT, drop in a spoonful of yam mixture and flatten with a spoon. (You should hear crackling when you put the mixture in) 8. Flip over when browned. They are done when both sides start to look pancakey (that speckly brown look, ya know). 9. You can put your pancakes into a warm oven until they are ready to serve on a beautiful plate. Remember, half the taste is in the appearance! 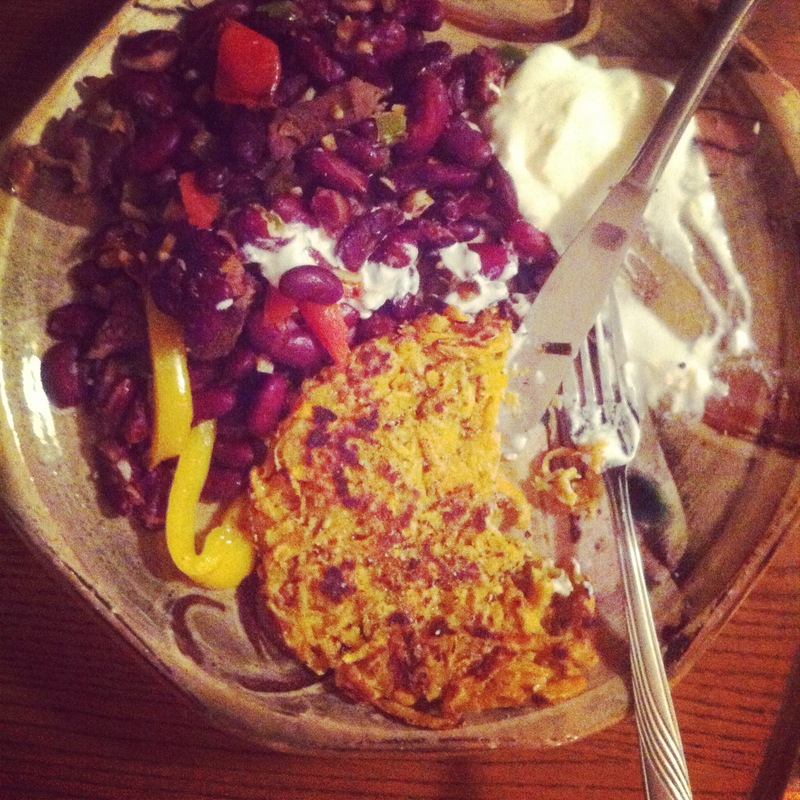 I served ours with HIGH-FAT yogurt (don't skimp on the fat, life is short), refried kidney beans, tomatoes, and sweet peppers. You could also use sour cream, salsa, or guacamole. Throw in some cilantro, parsley, and scallions and you've got yourself some Mexican yam pancakes. I also think they would be delicious with bacon and marmalade for breakfast. With a drizzle of honey and icing sugar. Here's my pancakes on the first plate I ever bought, made by Michael Connelly. I picked up a set of two from the Artstream Nomadic Gallery at NCECA 2012.